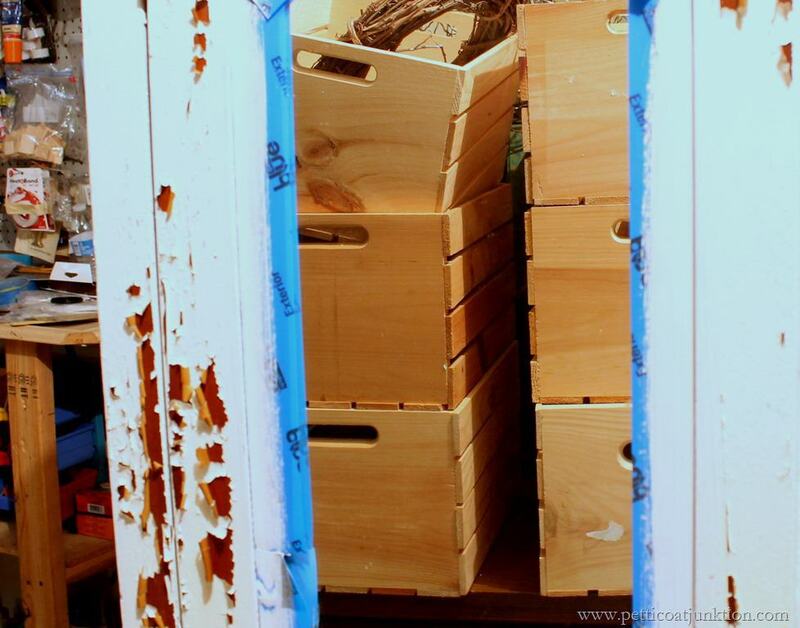 Earlier this week I posted about my Chunky Chippy Milk Paint Project. I promised to post all the details, my thought process, and how I feel about it. Here goes….. I purchased the wardrobe at My Favorite Junk Shop. 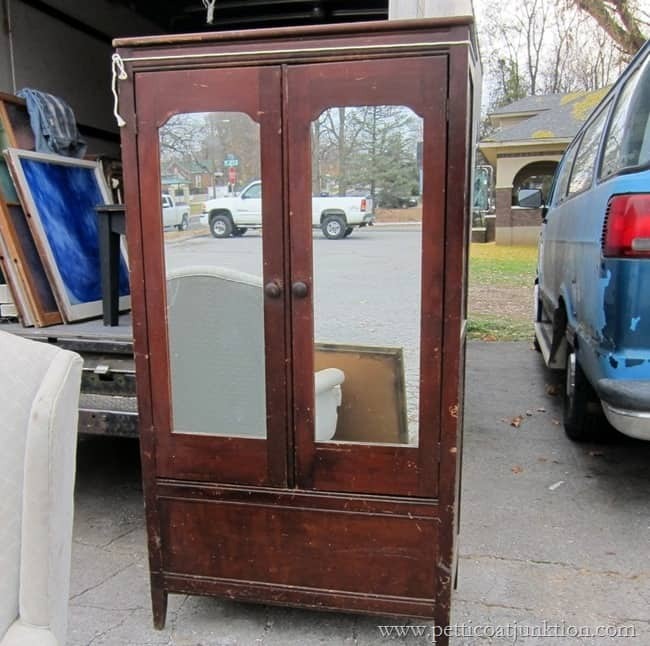 I paid way too much for it but I have a really hard time finding big pieces of furniture. And I loved the mirrored doors. I paid $100 for it….yeah, I know….but I wanted it. The JTS had to do a few repairs with the nail gun…. 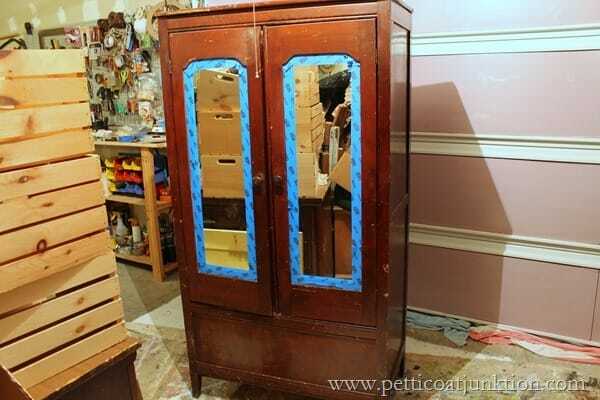 I taped around the mirrors with 3M™ Scotch Blue Exterior Tape because that’s all the paint tape I had on hand. 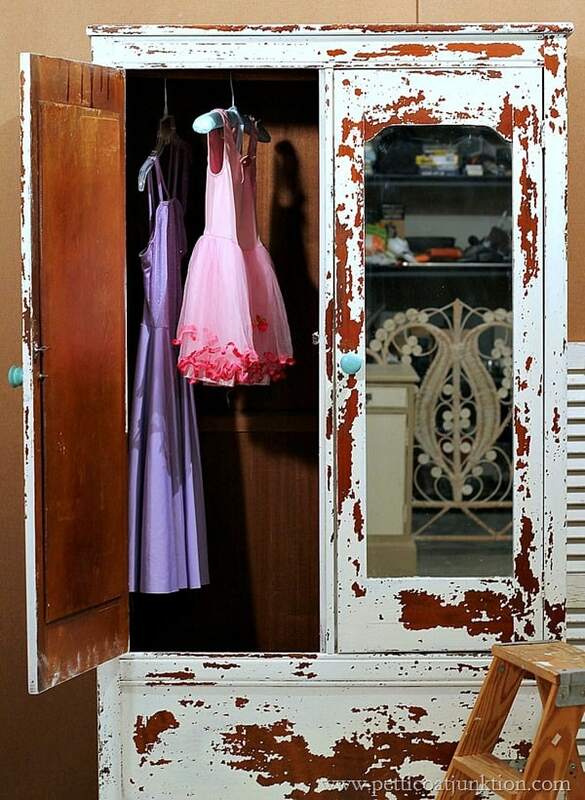 My vision for the wardrobe was chippy white paint with a slightly antique look. 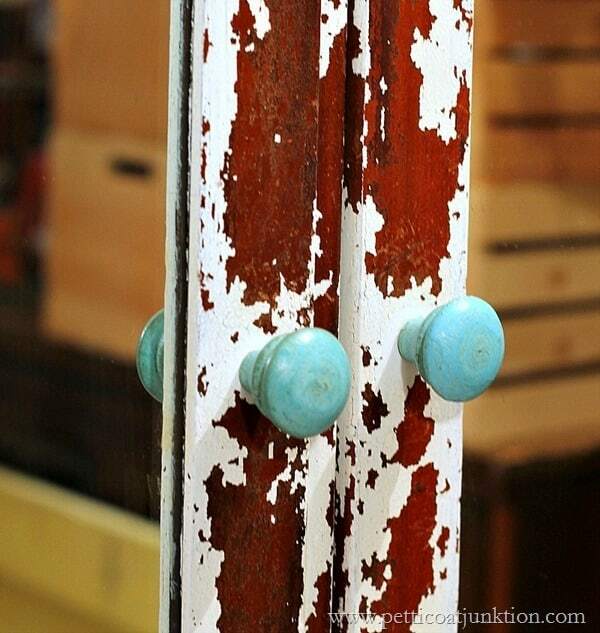 I started out with Miss Mustard Seed’s Milk Paint in Ironstone. I used ¾bag of milk paint and mixed it with water until I got the consistency I wanted. 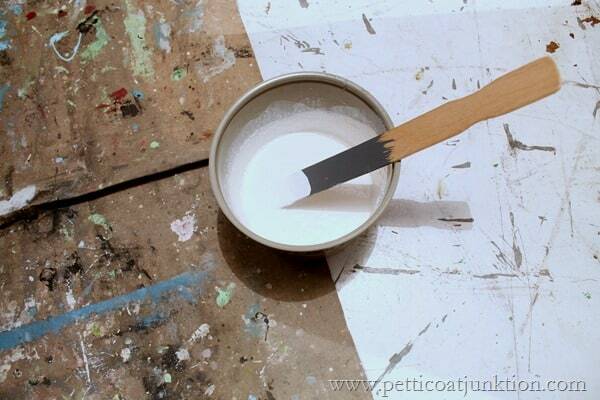 I like for the milk paint to be a little thinner than latex paint. This is what the wardrobe looked like after two coats of milk paint applied back to back. The milk paint dries really fast. I waited a couple of hours…walked back down to the workshop….and this is what I saw. Another hour later and it looked like this. I grabbed a few dry shop towels and started rubbing at the chipping paint. I went over the piece several times rubbing back and forth and in circles to remove all the loose chips. Then I took a paint scrapper to it and went over the paint with a light touch to get off the remaining loose paint. After I finished removing the loose paint I applied two coats of Miss Mustard Seed’s Neutral Wax. The milk paint doesn’t chip off after it’s waxed. 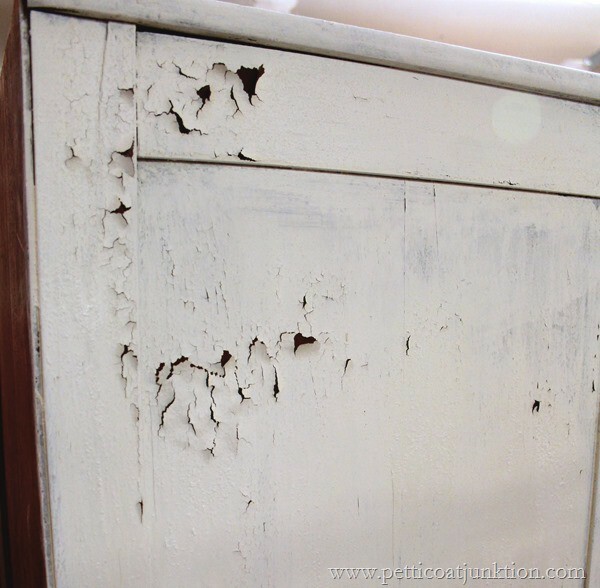 I’ve read accounts on other blogs that the paint continues to chip but I have never had this happen. The knobs are from Hobby Lobby….of course. Now…..I did not expect the paint to chip this much. 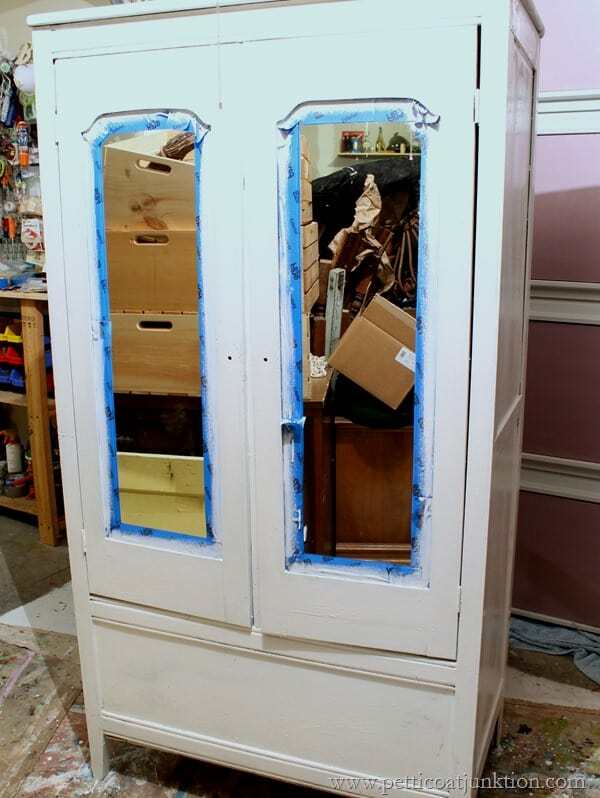 I kept looking at the wardrobe and the chunky/chippy paint trying to decide how I felt about it. It’s really hard to be objective about your own project. 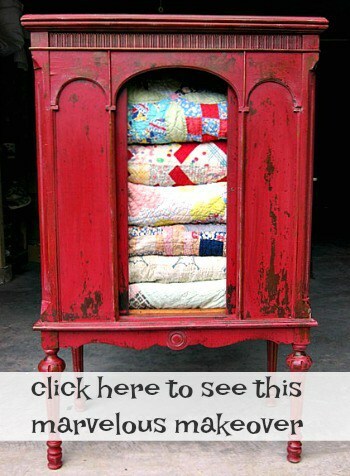 I finally looked at it this way….if I walked into a flea market or antique shop and saw this piece….what would I think? After thinking about it I knew then that I would love it if I just walked upon it in a shop. I don’t think you paid too much for it! Quite a deal from where I’m at. I think the chippiness suits it perfectly. Really pretty. 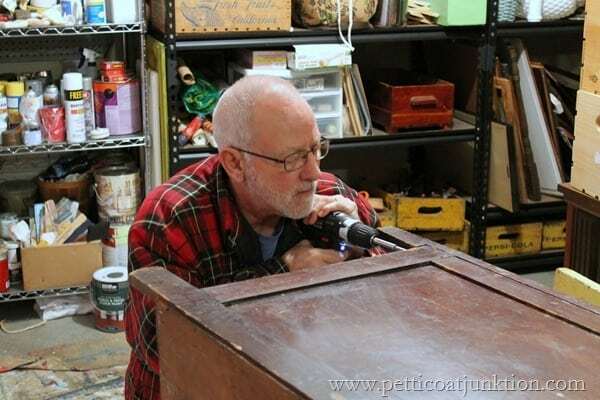 But, I just keep wondering if you replaced those knobs with some nice crystal ones. The period looking ones. Sorry don’t be mad! I just find that color and style too distracting on this piece. IMO they just don’t go together. It really is a lovely piece tho. 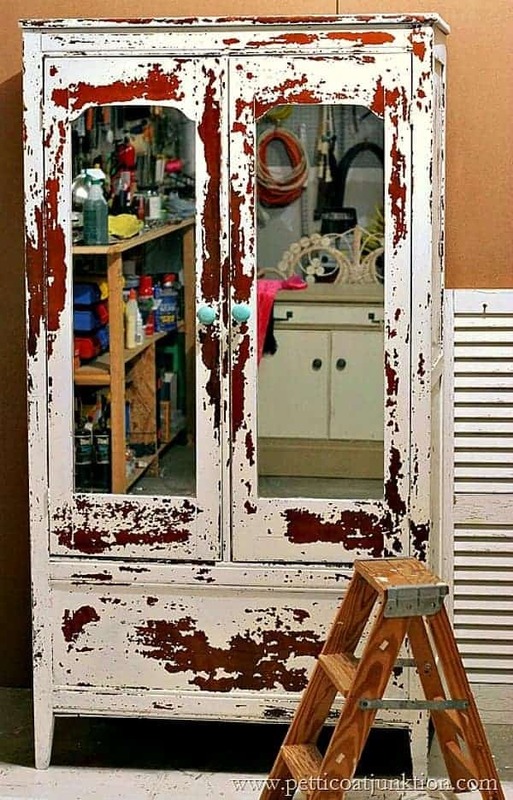 Oh, and maybe paint the inside of the door on the part that goes around the mirror? I think it would clean it up a bit. I was one of the responders who said this piece was not a favorite of mine and that I felt like it was too chippy. I hope I didn’t offend you. I look at the piece and can appreciate your creativity, artisitry and technique, your eye for creative design is very apparent. I just want you to know I was NOT criticizing your work, just stating my preference. Judy, I was not offended at all. I know this look isn’t for everyone. I appreciate your comment and please continue to read and comment. Hi Kathy. I love the chippy look. 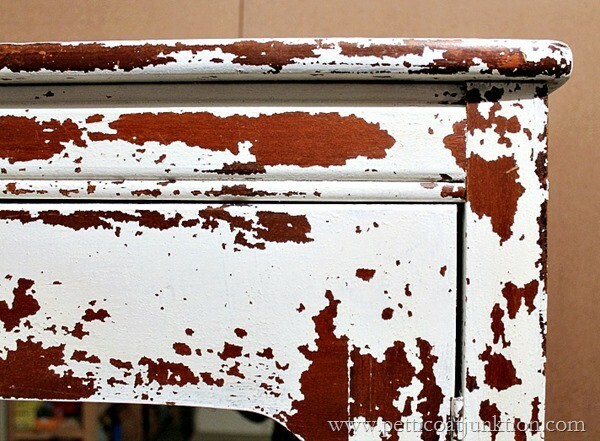 That is want when we use milk paint. My first project was a petite hutch that I did in Tricycle. I didn’t want the chippiness though so I used the bonding agent. What I want to learn how to do is take advantage of the chippiness with multiple layers of colors without feeling like I need to start over and sand it all down. I will research more on the subject and give it a try one of these days. I hate to waste paint so I don’t test it out first, but I will go for it one of these days. Thanks for sharing your projects. I’ve been wanting to try the multi-layer too. I did one project but I wasn’t as pleased with the results as I wanted to be. Thanks for the nice comment! Hi Kathy. If you get to try this in the near future, please post your project for all of us to be wowed. I think it looks wonderful and the best part is the turquoise handles. Love that pop of color. 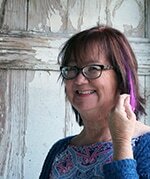 Hi Lora, I can’t wait to hear from you and your sister! Please let me know when you are heading to Nashville. Thank you for telling me about the ad. I have been working with google ads trying to get it blocked….so hopefully soon. I hate it too. I love the piece! You got a great deal on it -it would be way more expensive up by me. But i have a question, does milk paint just chip like that by itself? You don’t have to add anything to it to make it do it? And what if you put it over a painted piece? I think you got a really good deal on this piece. In my area, you would pay twice that. I just love what you did with it. Awesome! !